My friends Sarah and Graham have a delightful yard full of big trees, stretches of grass, and areas of closely packed low shrubs and bushes. The birds love it! Sarah keeps me up-to-date with the birds that are regularly seen. The other week she told me that there was a family of Red-winged Parrots with a couple of very young ones - and did I want to try for photos? Of course! Their back yard has numbers of large eucalyptus trees with lots of holes suitable for nesting holes. 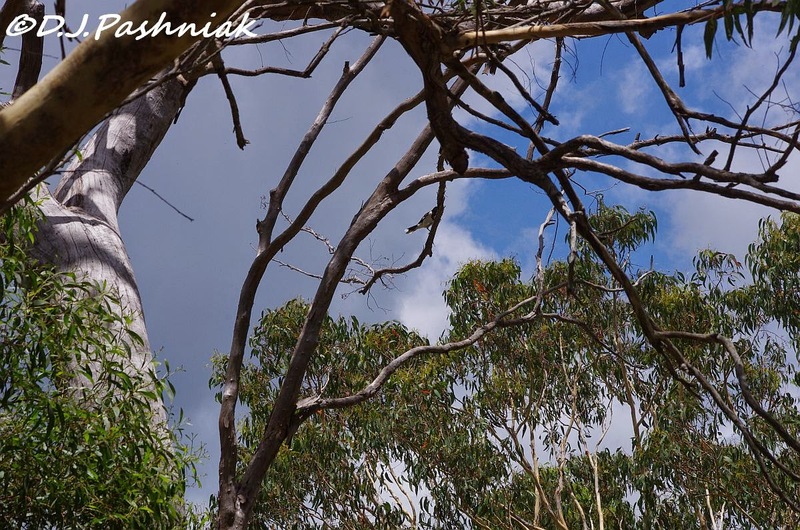 She also said that there had been King Parrots and Pale-headed Rosellas around. 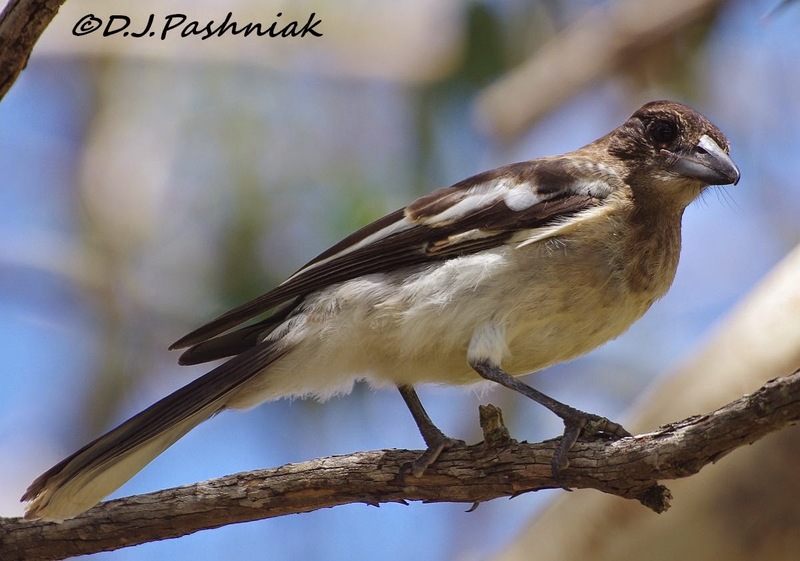 However, the only birds that came close while I was there was a family of Pied Butcherbirds (Cracticus nigrogularis). 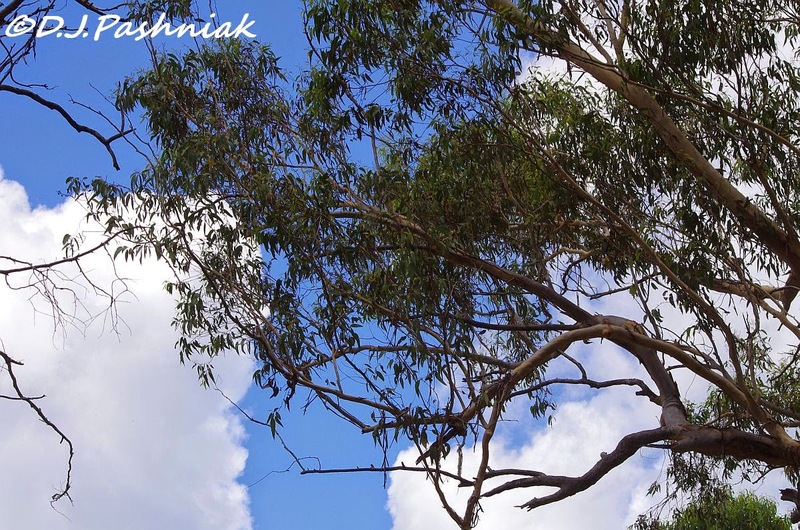 If you look carefully in that last tree there is one of the birds perching on a branch up against the sky. The first bird to come down close was a young one. It looked so small and cute down among the grass but it must have broken some unwritten adult rule because one of the adults came down and gave it a good pecking! The young one didn't know what to do except to crouch down submissively among the grass. As soon as the adult moved off a bit the young one flew back in among the bushes and stayed there. There was a second youngster which was a little bigger and kept out of the way on bare branches above us. Here is the adult. Look at that hook on the beak. It makes a good weapon and one of my birding books says that a Butcherbird is more dangerous to small birds than a bigger Hawk. they're really beautiful, if not fierce! That beak looks fierce for sure! Interesting to see them disciplining the young one. They are larger than I thought. Such awesome captures of those beautiful birds, Mick!! And beautiful skies and clouds as well!! They definitely look better than our GRAY ones!! Thanks for sharing! Have a great new week!! 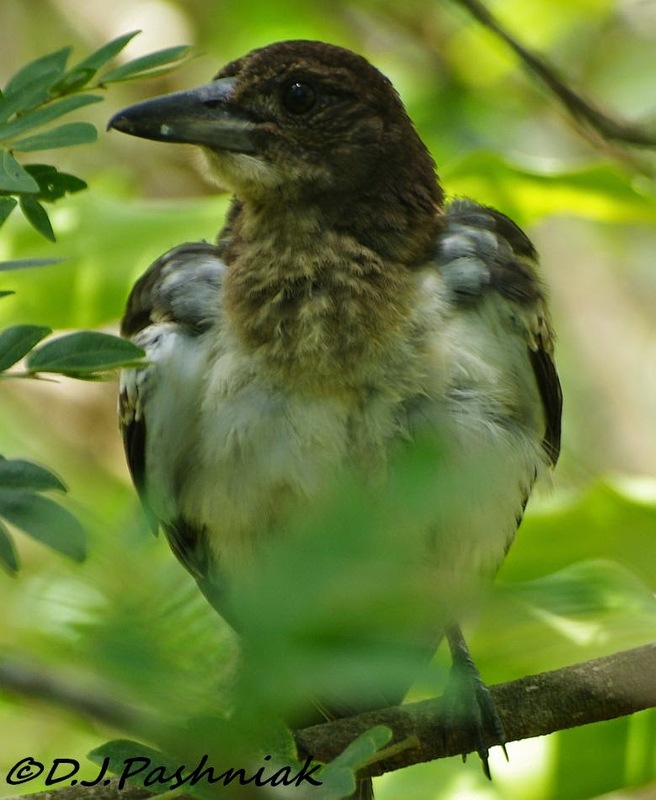 Great series on the Butcherbird. They do have a beautiful call. Wonderful photos and great sightings of the birds. 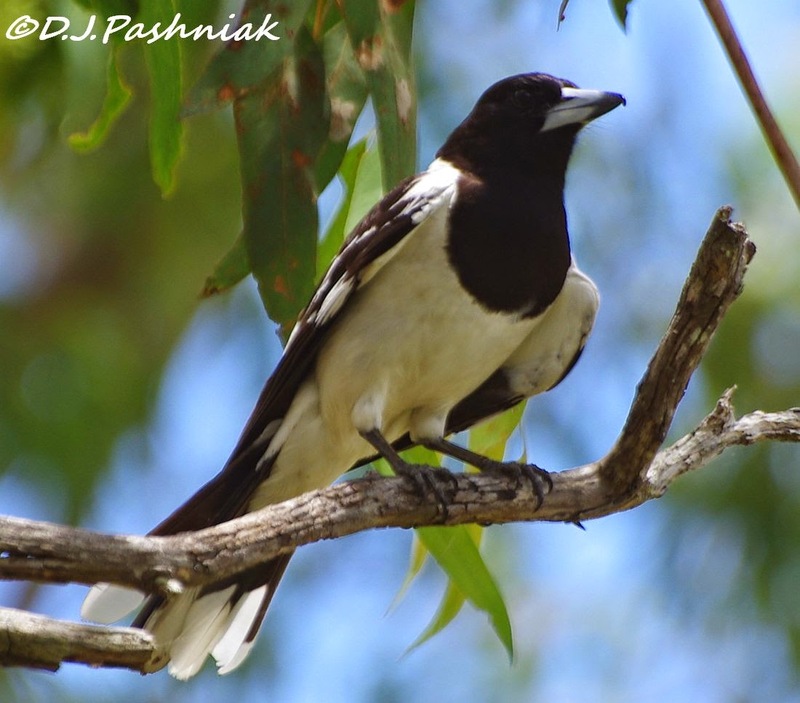 Your Butcherbirds sound a lot like our Shrikes.. Have a happy week ahead! I can imagine how that bill would cause considerable damage to many things, especailly being a bird ringer myself. Certain species we know to be wary of and treat with caution - added Pied Butcherbird to my list.Sometimes birds do display behavior that we don't full understand but I'm wondering if those adults didn't recognize the youngster because it was smaller than their instincts told them a young Buthcherbird should be and they attacked it as an "unknown"? It all makes for good birding. 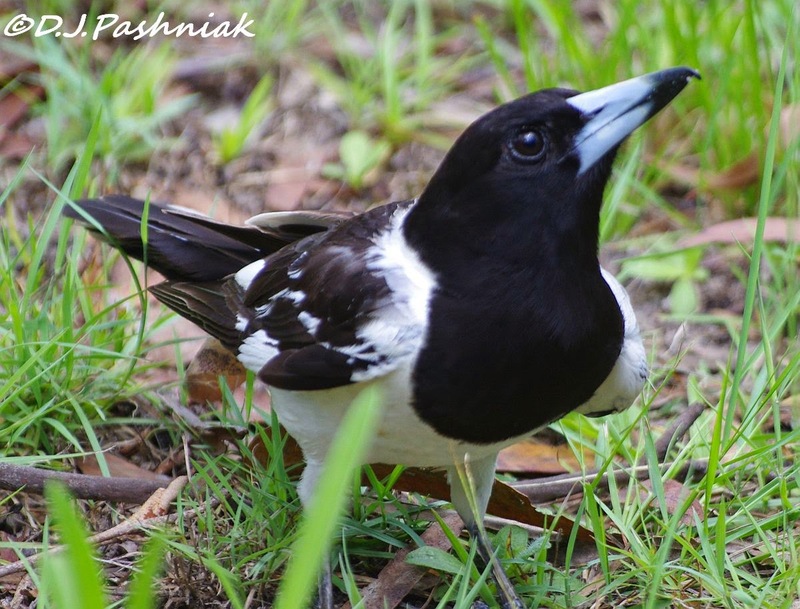 Great shots, I love to hear the song of the Butcherbird, and they do become tame and are not too wary of people. Have a great week and Merry Christmas. The adults sure look fearsome with that hooked beak. Great shots Mick. Wonderful birds - and I do love their voice. Not that I hear it that often in Victoria! Lovely to see the adults and the young of these birds. A handsome, but fearsome-looking bird. I feel sorry for that youngster. I've never seen a butcherbird this close. very interesting, especially that beak!